Again am here with yet another healthy lovely Malabar snack recipe. 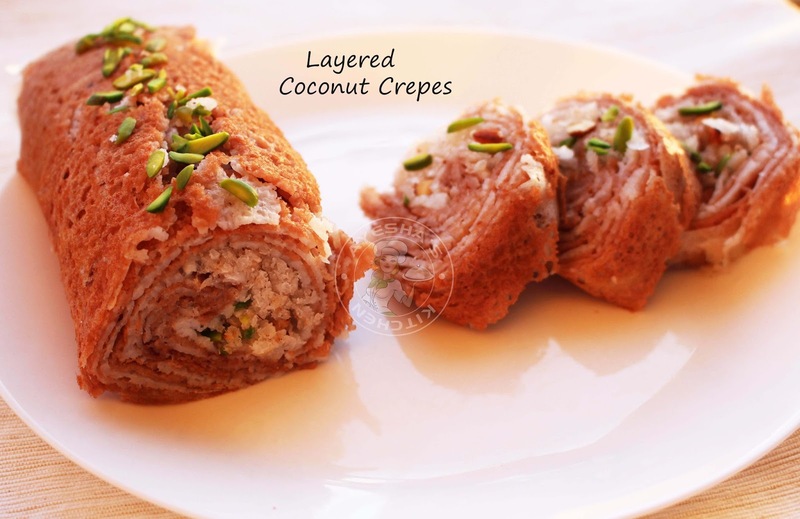 An easy and quick tea time snack with rice pancake batter and sweet coconut fillings. 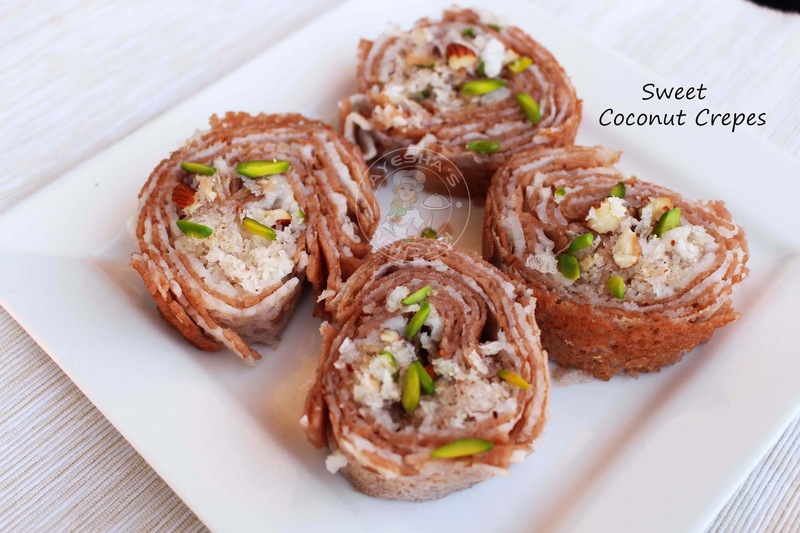 As i love experiment in snacks recipes, i do presented this kerala snack with a twist. Most of us will be very familiar with this snack which is called by different names like Madakku san, Mutta kuzhalappam, love letter snack, sweet coconut crepes, Mayyathappam and like so. And this is a twist to that popular snack. I made a crepe stack and rolled it to look like a cake roll or swiss roll. It was really fun in making this stuffed simple pancakes and is worth trying. In Kerala cuisine and Kerala recipes, coconut plays an important role. Especially evening snacks with sweet coconut filling reminds me of a drooling memories. Do try this healthy snacks for kids from school, they will love this and want for more. 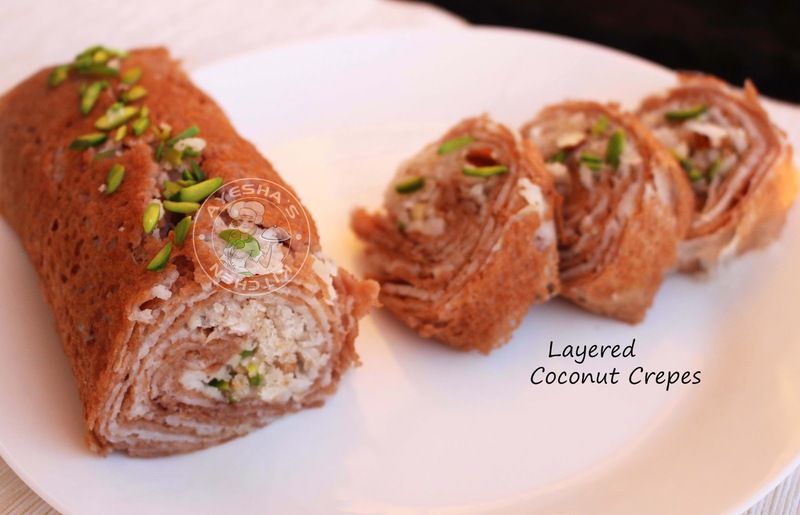 Here is the recipe showing how to make madakku san / layered crepes / love letter snack / good healthy snack ideas /snacks for kids /easy healthy snacks. Prepare the filling by dry roasting all those ingredients given under ' for sweet filling ' over a low flame. Saute them continuously until the coconut becomes soft. Do not make them crispy. When done, set aside to cool. Now we have to make crepes or dosa. For that, grind together rice flour and water (add half a cup first and then add accordingly). Make a smooth batter. Add salt and mix well. Divide the batter into two bowls. Add nutella or hazelnut spread to one bowl and mix well. The batter must be flowing in consistency (must be thin batter). Now heat a nonstick pan / neer dosa tawa/ cast iron tawa. (Neer dosa tawa is prefered). I used non stick pan only. When hot, grease the tawa well with oil ( but if it is nonstick pan you can just pour 2 tbsp of oil in the pan and grease the pan well and then pour the oil over the two bowls of dosa batter equally. so that no need of greasing after making each dosas). Now pour a ladle full of nutella mixed batter by rotating the ladle with batter to cover the whole pan.The batter should coat the pan in a thin layer. Let it cook for 2 minutes or until done. Once it is done take the dosa out with a spatula and now again grease the tawa,( but for nonstick pan ,no need of greasing as we already poured hot oil to the batter). Repeat the same and prepare nutella dosa and normal neer dosa (make atleast 4 dosas of each ).So crepes or dosa is ready. Now lets assemble the sweet / Madakku san/ coconut crepes / stacked love letter. Take a nutella dosa on a plate followed by normal dosa (crepe) and again the nutella dosa , like so repeat it. You will get a stack of crepes (dosa) with alternative color. Now keep the filling on the top and roll it gently. Decorate with some nuts or pistachios. Slice with a sharp knife. Serve warm and Enjoy. You can make the same crepes with All purpose flour(maida) instead of rice flour. But you have to add one egg along with flour. You can use leftover neer dosa or rice dosa batter for making this sweet. As the rice dosa batter is so thin, there will be cracks on the rolled sweet, yet so delicious in each bites. It is healthy to use rice flour instead of all purpose flour, especially for kids favorite snacks.